Stephen Cox's debut novel Our Child Of The Stars opens with a typical, small-town American family in the late 1960s getting ready for Halloween. But what makes this family different is that the only child, Cory, is an alien. Our Child Of The Stars is set in the late 1960s, when the space race and the Cold War were rumbling on and conservative America felt threatened by the rise of counter-culture. Nixon is in the White House and America is at war in Vietnam, but at the same time Woodstock is about to happen and people are muttering about the Age of Aquarius. Molly and Gene Myers are a young, liberal progressive couple whose marriage has been rocked by a miscarriage and Molly's subsequent depression, and who live in the sleepy town of Amber Grove. One day a disaster strikes the town when a meteor crashes into it, and Molly, a nurse at the local hospital, works around the clock to treat the injured. But not all those casualties are human, and when a purple-skinned child with a tail, a strange smell and a face full of octopus-like tentacles à la Cthulhu needs looking after, Molly is determined that he gets the best and most compassionate care. And that means stepping when government scientists have their own ideas about what should happen to the orphaned alien. Our Child Of The Stars is sci-fi of sorts - Cory is an alien, after all, and there's also the question of the Ship, the spacecraft on which he came to Earth and which seems to have a mind of its own - but it will certainly appeal to readers who are in no way sci-fi fans and are looking for a feelgood story about acceptance and tolerance. Cory, rather like ET, is a naturally gentle soul whose grotesque appearance is soon forgotten by those who get to know him. It's telling that the assumption of the authorities is that Cory's people must be some sort of threat, despite Cory's assurances that they abhor violence. Some of the characters in the story were, for me, perhaps a little too good to be true - a few more convincing flaws wouldn't have gone amiss. That said, it's impossible not to like Molly and Gene Myers and their friends, and I enjoyed spending time in their company. 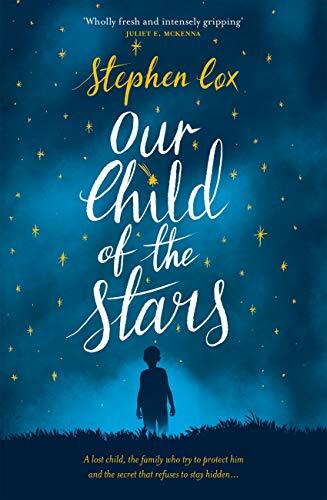 I found Our Child Of The Stars a heartwarming read which cheered me up in the bleakest month of the year. After a fairly relaxed start, it builds to a gripping race to its conclusion as Molly and Gene fight for Cory's right to be treated with the same kindness as any other child. This is a great debut novel and I look forward to reading more from Stephen Cox.